Way Hostel is within walking distance of most sights in Madrid and is near the weekly Rastro market, Puerta del Sol, La Latina and Plaza Mayor. 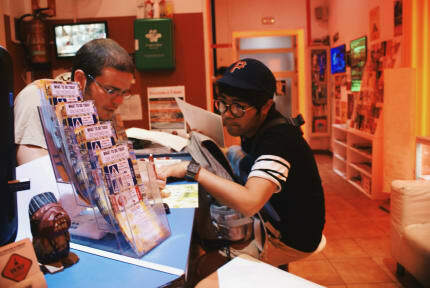 Hostelworld guests frequently recommend this hostel's free tours as a 'great way to see the city', saying they're 'really helpful for those who come to Madrid with no idea on what to do'. Our visitors have also praised the staff for being 'extremely helpful and [having] a great knowledge of the city', saying the hostel 'gives you an inside look at Madrid' and is 'less than 300 feet from a metro station but in a side street which makes it very quiet'. Great place. Everyone there was great from staff to other guest. Lots to do through the hostel which was great. Awesome location too. I enjoyed my stay at Way hostel. It’s a very social hostel, with a good common lounge and kitchen area. Bedrooms are comfortable and clean. Staff are great and can help u plan and arrange your visit to Madrid. Way hostel is great value for money! The staff were friendly, the location was great, and the kitchen had good facilities. They also made a bunch of churros in the morning which is an extra point. This is a great social hostel in Madrid. The nightly 3€ sangria party is a great deal and it’s easy to meet people here. The staff is super friendly as well. The tip-based walking tour offered is a great way to learn about Madrid. Not just a hostel, but an entire experience. So far this was my best citybreak thank to you guys. Thank you! Thanks for a lovely stay. I did not sleep well, but that was due to all the others in my dorm returning late at night - nothing you can do about that! This is a very clean and friendly hostel, excellent for younger travellers and very welcoming - and the hot shower was extremely welcome. One tip - put up a notice advising that you should carry your room key card everywhere to avoid getting locked out of your room, and also not to keep it next to your phone - this stopped mine from working!! Booked this hostel with some friends to visit one that is doing her Erasmus in Madrid and we totally didn’t expect the hostel to have a cool backpacker atmosphere! People were hanging out at the chill area all the time, playing beer pong or drinking sangria (3€ all you can drink!!) at night. The backpacker amongst us felt a little like they were on the road again ;) Also, the staff was really nice and they will do everything they can to help you (yes, everything!). Will come back some time! Great Hostel! Really good location (just 6 minutes walking from puerta del Sol), next to 2 underground stations, and the area is full of supermarkets and nice restaurants. The kitchen and bathrooms were always clean. The staff is super nice and always ready to help. I would definitely recommend it!!!!! Overall a perfect location, but I will note that there was a lot of internal construction going on in the building so definitely expect some noise/facilities workers walking around, but other than that it was good for 2 quick nights in Madrid before traveling to the south! We care above everything else about our guests and their needs. We generally attract people aged 18 to 60 years old who have a good vibe and are open to meeting other avid travellers. For fun we do pub crawls, a tapas tour, paella night and drinking games, or we go out to the nearby nightclubs and bars. Sometimes we just chill out in our recently-refurbished lounge. I think we really do offer the best value for price in Madrid, because we've got large, comfy rooms and lots of bathrooms. We're not more than 15 minutes away from Sol, the Rastro Market, La Latina, Retiro Park, the Royal Palace, Gran Vía, Plaza España and Plaza Mayor, but the one place I usually recommend that people see is the Templo Debod.